The David Gregg III Memorial meet was held Feb 2 in Richmond. There were 124 swimmers entered in the meet, about 25% more than last year! The results have been uploaded to the USMS database and posted on our website. We have a few photos, too; please let me know if you would like to share your photos with the LMSC. 77-year old Frank Miller was welcomed home by the timers after finishing the 1650. The Sprinter award went to the swimmers with the lowest cumulative time in the four 50 events. Luke Nelson and Shirley Loftus-Charley showed their fast-twitch mastery of the short distances in claiming these awards. 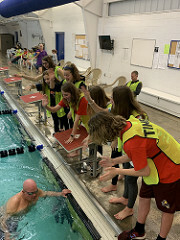 The Distance award went to the swimmers with the lowest cumulative time in the 400 IM, 500 free, and 1650 free; no female swimmer braved these three events, while Carl Ingebretsen took home the honors for the men.